Today, the consumption of on-line media has created a rapid spread of news and information. Not only can we read large amounts of in-depth media, we can readily create our own personalized media. Recalling my personal experiences as a young motorsports fan in the mid-1990s, I remember unfavourably a time that I was not even the basic miracle of cable television. With exception of the Daytona 500, Indy 500, the Canadian Grand Prix and the odd Indy Car Series race (notably the Toronto Indy event) my first exposure to a past weekend’s auto racing action was limited to whatever small segment broadcasted on local news. There was also a bright spot in my motorsport fanaticism where I discovered the now-defunct CBC Sunday Night Racing program that often reran Formula 1 and the occasional Indy car event from earlier in the day. As for NASCAR, my options for following some of my favourite stock car drivers in-depth (such as Dale Earnhardt) were limited. With only the winner receiving mention in most sports news on television, I would only be able to effectively build my enthusiasm for NASCAR and other forms of auto racing by reading specialized periodicals. Stock Car Racing Magazine and Inside Track Motorsport News were the two publications I read about the current stars as well as the future racing star’s climb up the support series ladder. I read about Tony Stewart shortly after his Indy Racing League career began in an issue of Stock Car Racing Magazine with only his untapped ambition and none of the on-line speculation we are used to today. In fact, I had never been exposed to the so-called “Information Superhighway” where a site known as NASCAR.com would change the way I would absorb my favourite athletic competition. Around 1996, NASCAR.com was a simple site where a still humble sport of stock car racing was able to inform fans or develop potential fans through a specialized source. Launched within a time where more people were familiar with the Rolling Stones tune “Start Me Up” that drove the sales of Windows 95, the NASCAR.com was in place to greet an Internet audience without knowing how mainstream the virtual landscape would become. NASCAR was one of the first major sporting organizations in the United States to launch a high-functioning website to relate happenings with fans. It seemed that while other major league sports such as the NHL and MLB took to the Internet, there was still initial confusion for how a website representing a sport should operate. NASCAR.com quickly found a way to provide a unique look on a form of competition that remained neglected even as the major stock car racing sanctioning body rapidly grew. In fact, it is highly likely the NASCAR.com website played a pivotal part in the success of the sport through the late 1990s. As NASCAR entered new markets and sought a national presence similar to the NFL or other sporting bodies, spreading its message of motorsport entertainment across the United States and even around the world became aided by the boom of information technology. I particularly enjoyed the simplicity of the earlier NASCAR.com website where the race results were readily available and the use of advertisement remained unobtrusive. Since the takeover of the website by Turner Sports Interactive, NASCAR.com has grown to become a more elaborate portal where a full press NASCAR editorial staff and enhanced features such as video is designed to deliver more perspective for fans following the stock car racing sport. Some fans have actually voiced the displeasure in what is expressed as a less fan-friendly site. Today’s NASCAR.com is a hub where real-time data such as active leaderboards and even live TV feeds are available to race fans. The newest venture alongside Twitter expands on a phenomenon made apparent during the 2012 Daytona 500’s infamous ‘jet dryer crash’ red flag. During what was a lengthy clean-up on-track, the driver of the #2 Miller Lite Dodge Charger Brad Keselowski brought some life to what is traditionally a period of boredom. Grabbing an iPhone stored on-board his race car, Keselowski took to his Twitter account posting in-car photos and various ‘tweet’ messages. The reaction to Brad Keselowski’s activities was greeted favourably among social media and was acknowledged by general media who otherwise had little to report. The Twitter.com/#NASCAR experiment appears to be the logical expansion of the Daytona 500 highlight away from the actual race. 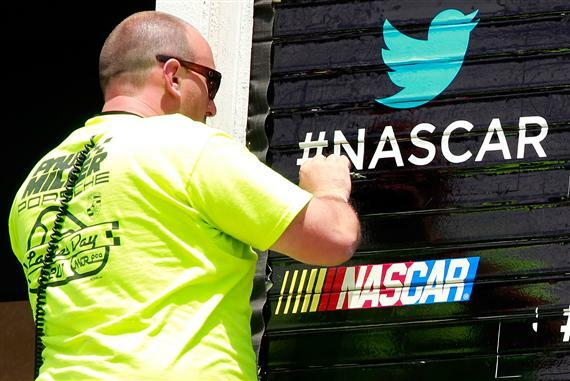 Despite long racing automotive technology that is considered decades behind street cars, NASCAR appears to be one sport innovating their reach effectively over modern communications.